Have you been longing for more jokes about Emily Dickinson in your life? Then Shipwrecked Comedy’s brand-new literary-themed webseries Edgar Allan Poe’s Murder Mystery Dinner Party might be for you. Billed as “Midnight in Paris meets Clue,” the 11-part series brings together famed authors including Ernest Hemingway, Charlotte Brontë, and Oscar Wilde for a themed murder-mystery dinner party hosted by Edgar Allan Poe (Sean Persaud) and his sardonic ghost companion Lenore (Sinead Persaud). 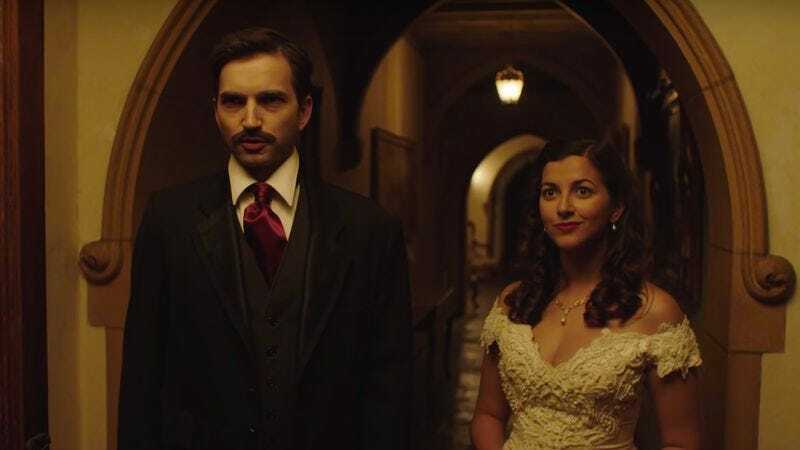 Building on the socially awkward, lovelorn version of Poe the channel created back in 2013, the macabre poet is once again desperately trying to impress the object of his affection, Annabel Lee (Mary Kate Wiles). But things go sideways when the murders at his party become real. Directed by William J. Stribling, the cast comprises familiar faces—at least for those engrossed in the world of YouTube. Wiles and Ashley Clements appeared in The Lizzie Bennet Diaries while Lauren Lopez and Joey Richter made names for themselves in StarKid’s Harry Potter musicals. Plus, Parks And Rec’s Jim O’Heir (a.k.a. Jerry a.k.a. Larry a.k.a. Gary) is set to pop up later in the series too. New episodes of Poe Party—which just debuted this week—will be released every Monday leading up to the finale on October 31. Right now you can check out the trailer (embedded above), and there are also some character prologues to check out over on the Shipwrecked Comedy channel.